I have some interesting airsoft-related projects in mind, but they’re really in the larval stage right now, a little too early to say much about them. It’ll be cool though. Someone asked me “Man, why the f#%k does your mom keep giving you weapons? !” because, yeah, this is not the first time. 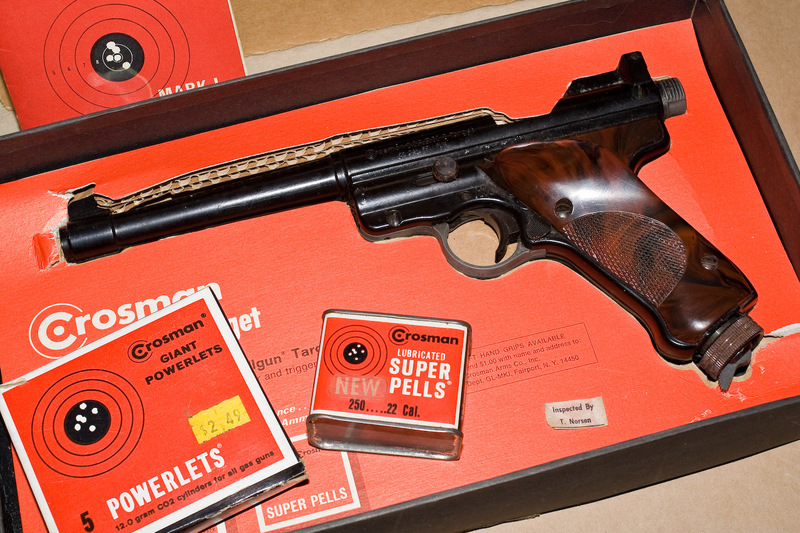 Recently she brought me a sword cobbled-together by hillbillies that we’ve come to call the ‘Compleat Rural Defendre’ (sic)…pictures to come once I work up a Diablo-style stats screen for it… And before that, she found me this beauty; A pre-1975 Crosman Mark 1 Pellet Gun, IN THE BOX, with an original tin of pellets, and a box of CO2 cartridges. And I know it’s pre-’75 because in ’75 they removed the pressure adjustment screw and clamped it to a lower projectile velocity, because people were leaving it wide open and then complaining about crappy gas efficiency. Claudio Grassi’s YouTube channel, primarily chronicling the construction of his 1/6 scale radio-controlled 6×6 truck, with functional hydraulic power steering and air brakes…all handmade! His videos on broaching the planetary gears for his 6-wheel drive powertrain were especially enlightening. I stumbled upon this thread about a really awesome compressed air V8 that Chuck Fellows machined. Hella impressive! You should also check out his YouTube channel. One of my many hobbies is collecting airsoft guns. Given that I am exceedingly poor, I have taken great interest in making airsoft guns and accessories. Electric guns are easy, everyone knows how they work. Gas guns are…not so easy. I mean, the general how is fairly easy to understand, but the mechanical details and the way valves and stuff go together… So I did a lot of digging for information, and that’s when I stumbled upon a patent, as well as the whole ‘Google Patents’ sub-site. Once I figured out how to search right, my brain’s knack for retaining seemingly pointless trivia whether I want it to or not came in very handy. For instance, a lot of Taiwanese and Hong Kong airsoft company names are seldom given as anything other than acronyms… But the full names— which over the years I have occasionally come across —are what’s on the patent applications. Examples: ICS = I Chih Shivan Enterprise Co., Ltd. and HFC = Ho Feng Industry Co., Ltd.
And of course the Japanese companies like Western Arms have all sorts of patents. And all these applications have mechanical drawings. Not dimensioned or anything, but I get the idea of what’s going on. Nothing to report right now. Been planning a lot of stuff, plotting out my whole operation and my idea portfolio. Made an order at Harbor Freight, will have a little something to post next week! I’ve come up with this new format where I’m going to try and post a weekly status report summarizing the week’s happenings, whether I’ve posted about them or not. That way, if there’s things I’ve uploaded pictures of to show people on IRC, but I don’t write a whole blog post about it, it still gets mentioned, and the images linked. I’ve been sidelined pretty much since mid-June by a spate of nasty illnesses, on top of which, a visit to the eye doctor turned up that my sudden rapid decrease in eyesight is due to a degenerative condition of the cornea and can’t be corrected optically. Best. Summer. Ever. Okay, I got utterly steamrolled by the holiday season, I’m still getting caught up. 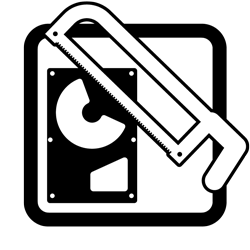 I have a couple reviews I still need to write, I’ve begun working with mold-making and resin casting, I have the parts for my CNC mill conversion… There’s a lot of stuff I need to write about, and I’ll get to it ASAP. Normally, I buy my raw materials and fasteners from McMaster-Carr, but the one downside is that I know I’m always facing a $10~30 shipping fee and I won’t even know what it is until days later when they actually bill me! Because of that, I don’t order from them unless I have a comfortable surplus of cash. It also means I try to consolidate my orders, to make the shipping worth it. So, while they don’t replace McMaster– not by a long shot –they’re definitely on my list of regular suppliers now! You CAN use Amazon.com giftcard balances on AmazonSupply, but there’s a catch; you have to find the item on AmazonSupply and then paste the ASIN into the Amazon.com searchbar, and you’ll be able to buy it through Amazon.com and use your giftcard balance. How do accounts and Amazon Prime carry over, but not giftcard balances? When you grow up, you tend to get told that the world is the way it is, and your life is just to live your life inside the world. Try not to bash into the walls too much. Try to have a nice family life. Have fun, save a little money. That’s a very limited life. Life can be much broader, once you discover one simple fact, and that is everything around that you call life was made up by people who were no smarter than you. And you can change it. You can influence it. You can build your own things that other people can use. Once you learn that, you’ll never be the same again. Let me be the Polaroid back for your brain. The goal is to achieve a lead-time from idea to physical reality that is so short as to be more like a single action than a process; almost indistinguishable from magic. I like making things. And because I have so many ideas in my head, I place a high value on anything that makes executing those ideas easier. I was born at a time when the ‘personal computer’ had just come into existence, and so my life has been tightly intertwined with the evolution of technology in this era. I don’t envy big business right now, we’re approaching the point where any fairly savvy person is going to be able to make a lot of the doodads they would otherwise buy, not to mention make the doodads for the less-savvy to buy. But that’s just the start… Eventually these tools, these things that make other things, will become so turn-key that everyone will be able to use them. It’ll be a very bad time to be a big corporation or a manufacturer…and a very good time to be a designer or a creator. And so, with this blog, I plan to document my making of cool things, and my making of things to make the cool things. To share my knowledge as best as I can, and hopefully keep it interesting and entertaining.